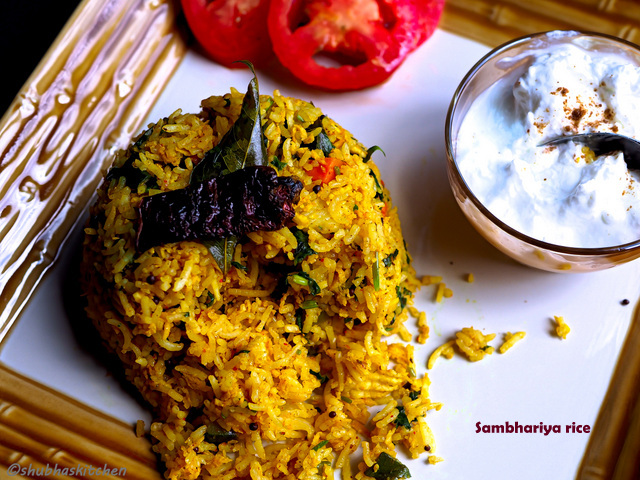 Sambhariya Rice is a delicious one pot rice meal loaded with coriander leaves (Cilantro leaves) and fresh shredded coconut. You can use the vegetables that you have on hand and a wholesome meal is ready in no time. Serve it with papad and raita of your choice. Heat oil in a deep bottomed non stick pan. When hot, add the mustard seeds, sesame seeds, 1/2 tsp turmeric powder, 1/2 tsp red chilli powder, curry leaves and dry red chillies. When the seeds start to splutter, add the chopped vegetables. Sprinkle some salt. Add 1/4 cup of water and cook covered. In a mixing bowl, mix freshly grated coconut, chopped cilantro leaves, 1/2 tsp turmeric powder and 1/2 tsp red chilli powder. Once the vegetables have cooked and all the moisture has evaporated, add the cooked and cooled rice. Add the coconut -cilantro mixture to the rice. Add the garam masala. Adjust the salt (remember, we had added some salt to the veggies earlier). Mix gently. Serve hot with papad and raita of your choice. Truly delicious. Fuss free, one pot , wholesome and hearty. Loved it. 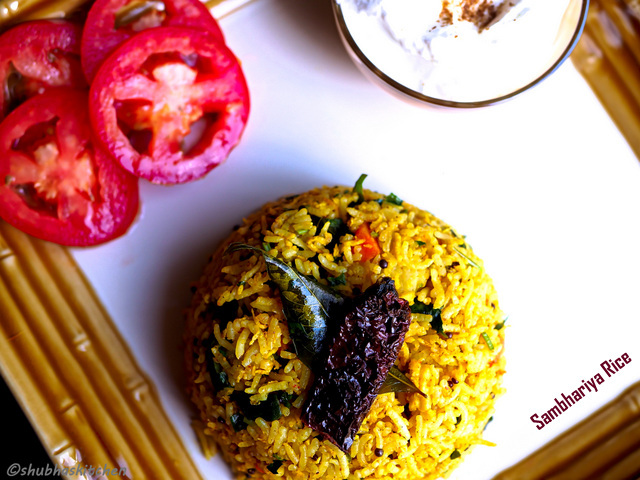 The gorgeous looking sambhariya rice appears to be a perfect family pleaser and also a wholesome meal in a single pot with vegetables, herbs and spices alike. I'm loving the use of sesame seeds in the tempering which is sure to add its unique zing. Coriander and coconut will lift up the flavors like anything. I am surely trying this dish soon. Thank you for sharing dear. Comfort food and looks delicious. A well explained recipe. YUMMY! 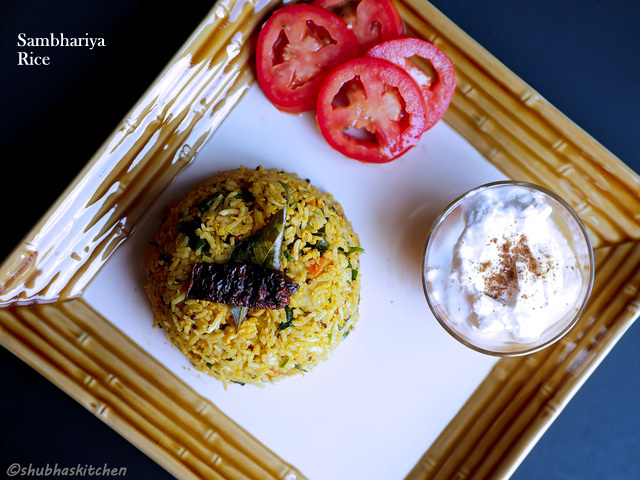 I am loving your rice dishes, Shubha! Truly craving for it now! Such an excellent recipe, love it! 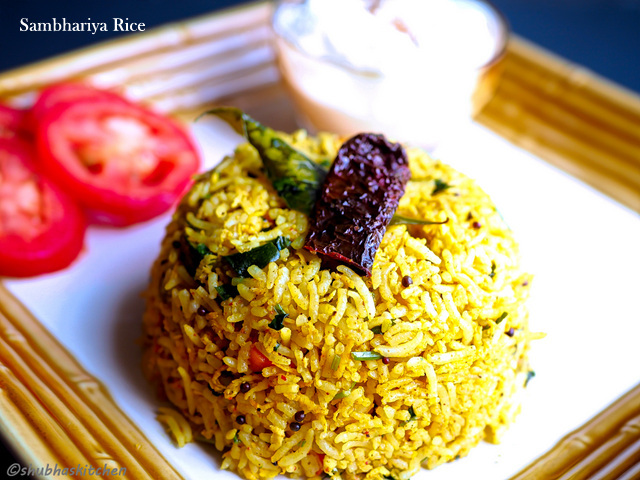 will be trying it pretty soon..
lovely sambhriya rice..inviting and perfect for any time or any party.. I am hungry, yes I am right now. I love rice and I am loving this dish. This looks so tempting Shubha!! Cant wait to try it!